You have come looking for tips on "how to detail a car" and this Expert is going to be revealing tips and techniques straight from the world of professional auto detailing. This process can be much more simple and straight forward than most people think. Due to the overabundance of opinions and bad information, it is a topic that can leave many confused and frustrated for lack of a trusted source. Maximum Results with Minimal Efforts! Regardless of what topic in life we are discussing, any task can be designed with efficiency and effectiveness. Auto detailing and cosmetic car care in general is nothing more than a combination of different types of tasks, all culminating into the art of detailing a car as a whole. Let me show you how twenty years of first hand experience has allowed me to create processes of detailing that will not only get you from point A to point B with much more efficiency, but with better end results! My simple car detailing tips will help you get superior results that are normally reserved for professional detailers like myself. Some expert tips for repairing the many forms of car paint scratches. See how the latest car buffers and polishes allow even a complete beginner to perform professional level results safely and effectively! Learn just how simple and straightforward this part of car care can be with effective and efficient tips. Black vinyl trim can be problematic for many car owners, learn which products can be used to clean and restore. Yes it is possible to polish glass to remove scratches from your windshield. Shopping for the best tire dressing is much more complicated than most would think; you better read up first before you buy! See what I recommend when it comes to polishing mag aluminum wheels, chrome wheels, billet aluminum wheels, or any other metal parts on your car. Is the side door moldings on your car or truck discolored or oxidized. See how a simple household tool combined with an effective cleaner will turn your dull and discolored side door moldings into new again. Darren shows you his secret tools and product for removing car decals, vinyl graphics, and car emblems and badges. Darren shows you two engine degreasers that are not only safe, but effective whether you are a professional, or a driveway detailer. Lean the simplified basics of car upholstery and specific steps of cleaning and maintenance. Learn why you are getting poor results from your upholstery cleaner and actual steps to improve your efforts. Learn proper car leather care in simple terms including actual cleaning tips. Introducing (2) of Darren's tricks for additional profit services for any professional detailer or for all those "Do-it-Yourselfers" looking for the exact tricks to producing professional results. Think you can't use a high-speed buffer to remove the oxidation and restore the shine to your boat. See how the latest in high-speed buffers are super user friendly. Looking to cut through the endless reviews and hype. There really is a system that is virtually fool-proof that any true beginner can use to get professional results. 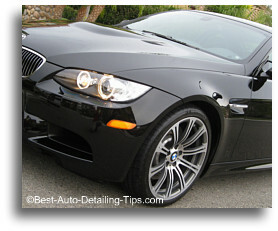 We are buried in opinions and information when it comes to how to detail a car and picking the best wax for the moment. See the top picks when it comes to waxing your cars. Cleaning the car windows without streaks and smudges can be accomplished by following a few simple techniques combined with a few tools that promise to deliver professional results. Jeeps present unique problems of detailing due to an overabundance of body fasteners, hinges, and vinyl trim pieces, see the expert products and tips of success. Auto engine detailing is a scary proposition to most people, see how simple and easy you can have a clean and detailed car engine including tips and tricks of the professional auto detailing world. Boats like cars need protection too. Find out the top picks when it comes to protecting and beautifying your boat. For many people, a detailed car includes a perfectly detailed car engine. See these pictures of meticulously detailed auto engines. Use the following "How to detail a car" links as additional resources. This site has expert auto repair tips and advice and a question and answer section for your auto repair questions. Thank you for visiting "how to detail a car". I hope you have found some useful information to get you better results than you are used to getting.